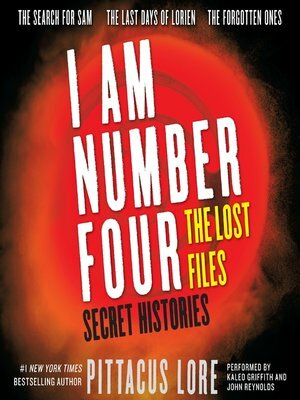 I Am Number Four: The Lost Files: Secret Histories is the second collection of action-packed novellas from Pittacus Lore. Initially published separately as digital originals, these three stories are now together in one volume. Lost Files: #4: The Search for Sam follows the rogue Mogadorian Adam on his journey of redemption as he finds the key to saving both Sam Goode and his father, Malcolm. Lost Files: #5: The Last Days of Lorien reveals how the fight began with the once-peaceful planet being taken by surprise and attacked. Lost Files: #6: The Forgotten Ones is the riveting continuation of Adam's story, in which he uncovers an incredible secret that will turn the tide for the Garde. You know the truth about the Mogadorians' invasion of Earth and the Garde who will do anything to defeat them—yet there is still so much to learn. The stories in Secret Histories will help you get the answers you seek, but they will not help you stop the coming war. Only the Garde can save our planet.